As gamers, we have put in an obscene amount of time into our hobby. Personally I find that not only do I remember these games, but what really has an emotional response are the things I've add to the games myself. What kind of things you may be asking? Well, take that gif up there. I wrote a post about the very first time I played a video game. In it I talked about vine dancing in Mario and how that was what drew me to the game. 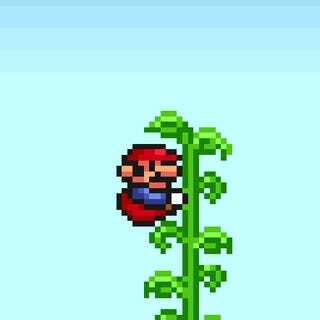 Such a simple thing, and really who knows if Mario was supposed to be shaking it on top of a vine or not. Well, GBD might, but what mattered to me is that he did dance and it's engrained in my memory forever. A few years after Mario, there was a little game called Street Fighter 2. My sister and I played it so much, because it was one of the few games we could play together. There were a several things we added to that game, but the one that stuck out the most was the song we sang every time E. Honda won. Every time he struck that pose, my sister and I would sing, "Stop! In the name of love, before you break my heart!" Why? I don't know. Why not? The strange thing is that when we were playing the Street Fighter game on the 3DS, we still broke out in song when E. Honda beat someone. This next one is really out there. Usually the things I add to games make sense, but this one is well, you'll see. The Legend of Zelda: Majora's Mask...the bane of my Zelda experiences. I played that water temple for weeks. And because of that, I got bored of the music. So I turned on my own...one of my new (at the time), and still favorite CDs. Warning: following song is NSFW...in a big way. For some reason, Crazytown and Majora's Mask go together. Crazy, but true. And that song in particular, because that temple became my revolving door...in a totally different way than the song is referring to. I have to sign (sign language...yes...) 2K. And then there is the Bobblehead mission for Marcus where I constantly sing Bobblehead...which is NSFW too. So what do you insert into games? While you're sharing, head over to TAYClassic and share more things. All the things!